You never know when you might stumble upon Randolph A. Celebrini painting up a storm when you're out and about in Tofino. Classically trained in the tradition of the old masters, this professional painter composes his pieces "en plein air", or "from life", much as the French Impressionists as well as Canada's Group of Seven forged out into nature to interpret light, colour and form directly onto canvas. Born and raised in Vancouver B.C., Celebrini underwent rigorous training that included several years of tutelage under master painter Paul Chizik of the Florence Academy of Art, as well as extensive travel to study major works in museums throughout North America and Europe. Occupying a studio in Gastown in the heart of old Vancouver, Celebrini spent 10 years painting the rooftop vistas, streets and alleyways scenes of the city and soon amassed a body of historically and socially important work that was to be be known as "The Buildings Collection of Vancouver". Meanwhile, a keen love for nature kept Celebrini heading west towards Tofino where he spent time surfing and painting landscapes. In 2002, Celebrini established a permanent studio in Tofino. These days, he can often be sighted toting canvases as large as 4 feet by 7 feet onto Chesterman Beach, Frank Island and the Rainforest in an investigate process to capture the immediacy of nature. The skill of painting from life recently landed the internationally collected artist a spot on the Art Auction Showcase in Los Angeles that featured him painting 2 models live on national television. Over the years, Celebrini has produced over 500 oil paintings, watercolours, drawings and prints investigating everything from light dancing on the ocean to Cuban musicians playing. His unique style has been called "Progressionist", combining a solid foundation in classical technique with new and vibrant influences pushing the medium of fine art painting forward as a poignant and relevant art form -- much as jazz musicians approach music. Celebrini is passionate to spend many more years painting the wondrous natural landscapes of Tofino. Contact Randy for a private showing of his art when you're visiting Tofino. 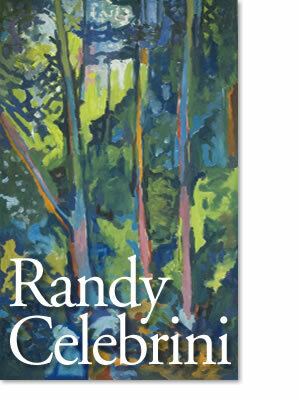 Tofino artist Randy Celebrini composes his pieces "en plein air", or "from life", and forges out into nature to interpret light, colour and form directly onto canvas.